With 4.5/6, I barely made the cut in the 7th round and squared off as black against GM Reynaldo Vera of Cuba. Although his rating has dropped over the past few years, he’s very experienced and was playing well at Cappelle (with a performance rating over 2600). Throw in the facts that he had been playing both sides of the Semi-Slav for about 25 years and that I used his book (Chess Explained: The Meran Semi-Slav) to learn it, and I knew it wouldn’t be an easy game. At my tournaments recently, even with one game a day, I only try to spend about 1-2 hours preparing for every game. I used to spend much more time preparing when I was playing sporadically (as in the summers of 2006 and 2007), but now that I work on chess much more, I have less to do in general. It also lets me conserve my energy for the game. Thus, even though I wasn’t sure where he would go in the Meran, I didn’t spend a bunch of time and decided to focus on the line in which Kazhgaleyev clobbered me. Unfortunately, I guessed wrong and he instead went with a line that has become pretty popular over the past 2-3 years: the 5.b3 Anti-Meran (1.d4 d5 2.c4 c6 3.Nf3 Nf6 4.e3 e6 5.b3). Kramnik won a couple nice games with it, and whenever Kramnik plays, people pay attention. When Avrukh made it a big part of his book, GM Repertoire Volume 1, it really took off. For example, in 18 games where I tried to play the Semi-Slav last year (i.e., I didn’t play the regular Slav), I saw this line 3 times. By comparison, I only saw the main line Meran with 5.Nc3 Nbd7 6.Bd3 a grand total of 0 times (that’s also why the idea I played against Kazhgaleyev had been sitting on the shelf gathering dust for over a year)! Ideally, he would break with e3-e4 at some point, putting serious pressure on Black’s structure. If Black takes on e4, he will be left with a horribly weak e6-pawn, while the alternative of allowing White to grab a ton of space with e5 is not particularly enticing. In this specific position, though, I had seen that 11.e4 runs into 11…dxe4 12.fxe4 Nc5!, taking advantage of the pin on the d4-pawn. If 13.dxc5, Black plays 13…Bxc5+ and then plays 14…Qxd3 with advantage. 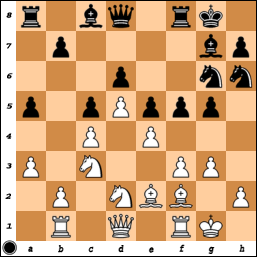 However, 13.Bc2 drops the e4-pawn, so White is not ready for e3-e4. To this end, he played 11.Qe2, guarding the bishop and preparing 12.e4. I was ready for this as well and played 11…Re8!, putting the rook on the e-file in anticipation of the e-file opening up. The point is that after 12.e4 Black can play 12…e5! and White is in some trouble actually. If White ever takes on d5 or f5, Black takes on d4 with tempo. For example, 13.exd5? exd4 14.Qf2 Ne5! 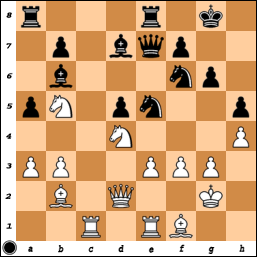 (covering f5 and hitting the bishop) and White is in real trouble – 15.Qxd4 Qa5! is even losing for White, who can’t deal with both …Bxd2 and …Bc5. Thus, I had defused White’s entire plan with Nfd2 – as GM Anton Kovalyov remarked in our post-mortem (amusingly, he was one of the guys against whom I tried this Stonewall approach last year), the knights on d2 and b1 look a bit funny now. Unfortunately, I relaxed a bit having dealt with White’s main strategic goal and proceeded to make a couple small errors. While it didn’t land me in a horrible position, it did mean things weren’t as comfortable as they could have been. By move 25 or so, both of us were getting a bit low on time and I decided that under those circumstances, the initiative was worth a bit more than usual. 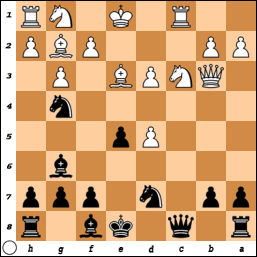 Black has the obvious plan of playing on the kingside, with moves like …Rg7, …Ng6, …Nh4, …Kh8, and …Rag8 all factoring in. However, as soon as Black puts a knight on g6, White is going to take if off – if a Black knight reaches h4, then White is going to be in real trouble (it’s virtually impossible to hold both g2 and f3 forever). Thus, if Black plays 22…Ng6 right now, White will take, and Black has no way of keeping the file open. 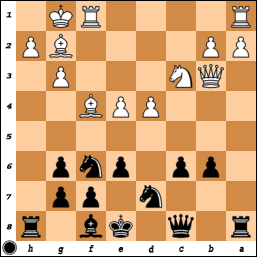 The h-file is not as useful as the g-file in this case, as the Nf1 guards h2 and it will take Black a long time to triple on the h-file. It’s been a few days since my last blog about Cappelle la Grande, but it’s now high time to wrap up the tournament. I finished with 6.0/9 –the same score I had last year – but I got there in a completely different manner. Last year, I played only two players above 2400 FIDE in 9 games; this year, I faced my weakest opponent in round 1 (GM Arkadi Vul). White has the two bishops, better development, and more space. It’s pretty amazing that I can find myself in these sorts of positions. Luckily, that also means I have some experience defending bad positions and so I wasn’t about to give up right away. I decided that I couldn’t just sit around and wait for him to improve his position with an eventual e5 (and Nc3-e4-d6) or d5 (if the c5-pawn is well protected), so I played 13…b6!, sacrificing a pawn. 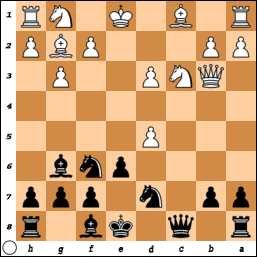 The point is that after 14.cxb6 axb6 15.Qxb6, Black has 15…Nh5!. The bishop is stuck to f4 because if it moves, then 16…Nxg3 wins the material back (the h2-pawn is pinned). Meanwhile, if he lets it get taken on f4, then his kingside will be quite open and potentially somewhat weak; the queenside, though, would also be open, and so he probably wouldn’t be able to use his extra pawn there for quite some time. I had seen an amazing defensive resource here. After 16…e5!, Black looks to be committing suicide – the Qb3’s diagonal is opened and White has castled, so f7 is going to be targeted. After 17.dxe5 Bc5+ 18.Kh1 Ng4, White is in some trouble, since mate is threatened on h2 and Black will take back on e5 with a knight next, guarding f7 and keeping the Bg2 shut in. 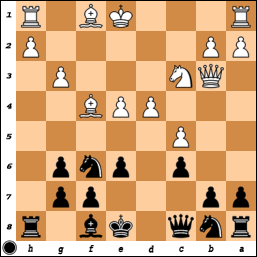 However, 17.Bxe5 looks quite good – after 17…Nxe5 18.dxe5, what is Black going to do? The knight can’t move from f6 because of Qxf7+. Luckily, I had seen 18…Bc5+ 19.Kh1 Qc7! !, which is quite reasonable for Black! The point is that after 20.exf6 Qxg3, White has no dangerous check and he can’t stop mate on h2 or h3 (if 21.h3 Rxh3+ and mate follows). He also has no way of guarding the e5-pawn, so if he doesn’t take on f6, Black takes on e5 with his queen and all of a sudden, Black’s position makes sense. After the game, he admitted he hadn’t seen this line, but he had felt that allowing …e5 was not worth considering. I was black against Ernest Real de Azua at the World Youth U-16 in 2000, and after an opening debacle found myself in the following situation. 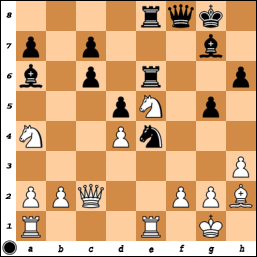 Luckily, though, White had just played 19.Nd2-b3?, which allows a stunning rejoinder – 19…b5!!. 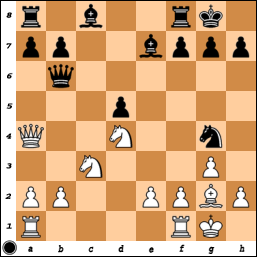 The point is to clear the b6-square for a knight so as to trap White’s queen! After 20.Qxb5 a6 21.Qa4 Nb6 or 20.cxb5 Nb6, the queen is trapped. Admittedly, White gets compensation after either move, and after 21.bxc6 Nxa4 22.cxb7+ the game eventually ended in a draw. 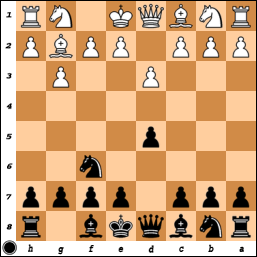 Still, given Black’s position prior to 19.Nd2-b3, that’s something to be happy about. I’m pretty sure I could write a whole book based on this chapter’s theme! I’ve finished my event in Cappelle la Grande and am now in Brussels, Belgium for a few days. I wrote about the first couple rounds at Cappelle earlier here, and I’ll wrap up the tournament in a couple posts in a few days. For now, though, I wanted to post on something else I saw. I came across these videos a few days ago, and while they’ve been making the rounds on some other chess blogs, I figured I would put the links up myself. The entire video is split up into 3 parts, each about 10 minutes in length, and document Kasparov’s simultaneous exhibition against a junior team of American players in 1988. Kasparov faced off against 6 American juniors: Patrick Wolff, Alex Fishbein, Stuart Rachels, Ilya Gurevich, Vivek Rao, and Danny Edelman. In the end, he won by a score of 4-2 – Wolff scored the lone win and with black to boot! Fishbein and Edelman both drew, although they went about it quite differently. Edelman took the draw with 14.Bg5 while Fishbein played 14.c4. Fishbein got outplayed in the middlegame and ended up in a worse position, but then finagled a draw in the endgame. So they got to the same place, but the journey was rather different. But that brings up what I thought was an amusing moment – Stuart Rachels shushed Kasparov! That was classic. To me, it’s a classic Kasparov move to try and get into his opponent’s head. Here, he dangles the chance of a draw in front of a young player’s eyes – if he accepts, that’s one less game to play and it’s a game with black as well. He can claim that White has the responsibility to play on, even though White’s “advantage” with the first move is more than offset by the difference in strength. Black sacrificed a piece for some strong pawns and is now very close to winning. Kasparov, though, messed up with the natural 58…e3?. This allows a draw after 59.fxe3+ Kxe3 60.Bxd3!! Rxd3 61.Ra1 with a theoretically drawn endgame. After 61…Ke2 62.Kg3 Rd2 (62…f2+ 63.Kg2 doesn’t get Black anywhere – White threatens 64.Ra2+ with a draw and 63…Rd2 doesn’t actually threaten anything) 63.Rb1 Ra2 and a draw was agreed. Black has no way of making real progress here as his rook can never leave the 2nd rank because of a rook check. Instead of 58…e3, though, Black could have won with 58…d2!, taking the pawn out of the firing line. After something like 59.Bb5 e3 60.fxe3+ Kxe3 61.Kg3, Black wins by bringing his rook to c1 and then using his king to break through. For example, 61…Rd8 62.Bc4 Rd7 63.Bb5 Rg7+ 64.Kh2 Rc7 65.Kg3 f2 wins. After 66…Rc1, White will have to play 67.Ba4, when 67…Ke2 forces at least one pawn through. Wolff got into some trouble in the opening and at this point in the game, he’s losing the d5-pawn pretty much regardless of what he does. In order to seek out some compensation, he lashed out with 13…Qh6! 14.h4 g5!. I’m not completely sure the attack is sound (the computer seems to like 16.Nf3 for White after the game continued with 15.Nxd5 Bd8), but it definitely bamboozled Kasparov during the game and Wolff scored the lone win for the American team. Here’s a link to the whole game for those who want to play through it – Wolff executed his attack perfectly after Kasparov slipped up on move 16. I don’t care that much for the first 3 frames, but that last frame is classic. I was reminded of it at Cappelle (and in Gibraltar … and in Sevilla for that matter …) when I saw some GMs who seem to think that one change of clothes for a couple weeks on the road is enough. And no, the occasional Febreeze-ing doesn’t make it cool. I can’t seem to find a clip of it on YouTube, but getting stuck on a neighboring board can be like sitting in the car from the Beyond B.O episode in Seinfeld. Who’s Afraid of the Exchange Slav? After my stop for some R&R in London, I caught a flight to Brussels and then got on the ChessBus from the airport to Cappelle la Grande. After last year’s event, I was not so keen on returning (mostly because of the food situation), whereas the other American players in the same group (Josh Friedel, Jesse Kraai, and David Pruess) were generally more interested on playing again. However, one year later, and I’m on the only one of the group who has made it back. Cappelle is an interesting chess event and in many ways is like none other across the world. The organizers essentially give conditions (free room + food) to most titled players, as well as modest appearance fees for GMs. Meals are served in a mess hall of sorts, where they provide lunch and dinner for hundreds of players every day. Although the prizes are relatively small (the prizes don’t seem to be advertised, but my guess is that first prize is around 2500 Euros), the tournament is quite strong because of the generous conditions. About 100 GMs show up every year, the record being 112 in 2005. While Gibraltar is a bit stronger at the top, Cappelle has much more depth. The tournament also attracts a number of lower-rated players, and this year there are about 700 players in all. If this was paired as a straight swiss like the US Open, then the top players would be stuck playing way down for a number of rounds. In order to make things more competitive and interesting, they accelerate the pairings. Thus, last year I played a 2350 IM in the first round, while this year, I played a GM in the first round. Pairings for the first round went up soon after the masses were served their lunch – I got the black pieces against GM Arkadi Vul. He’s an old GM whose rating has dropped quite a bit from its peak, but still, I couldn’t take him lightly. More troublesome than playing a GM, though, was that when I pulled up his games in ChessBase and made a tree to see his opening choices, I noticed that in 22 of 23 games against the Slav, he took on d5 right away! In Gibraltar, I had to deal with the Exchange Slav in my first round game, and I really seem to get a disproportionate number of them in my games. Well, this time I was having none of it. Instead of my standard …d5/…c6 move order, I played with the Triangle approach – …d5/…e6/…c6. If he wanted to play an Exchange Variation, he was going to have to play an Exchange Queen’s Gambit Declined – White might have better chances for an advantage in some of those lines, but it’s often less boring than the Exchange Slav! The position is dynamically balanced, and in fact, I almost saw this position as a bit of a mutual zugzwang! Both sides have a couple weaknesses (White has weak pawns on e3 and a3, while Black has a weak pawn on d5 and a weak square on b5), but neither side can really go after them without jeopardizing something in his own position. My opponent had already eaten up a lot of the clock in the late opening and early middlegame phase, and he continued to do so here. It’s not clear what either side’s plan should be, and as a result, this is a position where the time can just tiptoe by without you noticing. He played 21.Bd3, which looks quite reasonable, possibly threatening 22.Nf5. I didn’t particularly want to play 21…g6, but I also didn’t want to see him put a piece on f5. 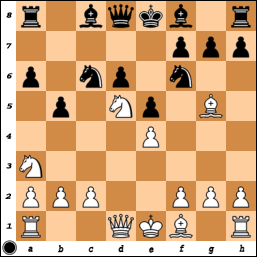 The long diagonal is weakened, but it’s difficult for White to take advantage of that. After another long think, Vul slid his king over with 22.Kh1. A somewhat mysterious move and it was accompanied by a draw offer. Objectively, I think the position is balanced, but with him only having 15 minutes (and the 30-second increment) to get to move 40, I decided there was no harm in playing on a bit. I played 22…Rfe8. I now played 28…a4, trying to wrest control of the c4-square from White. He had already made some unnecessary kingside weaknesses (with g3 and h4), and now I was hoping to get something on the queenside as well. Down to a few minutes, he now blundered with 29.Nc7 – after 29…Bxc7 30.Rxc7, Black has 30…Bh3+!, picking up the exchange. Admittedly, White does have the two bishops and there is no opposite number to White’s bishop on b2. Unfortunately, once the b3-pawn goes, a knight will land on c4 and remove that piece before it gets too strong. The game continued 31.Kxh3 Qxc7 32.Bb5 Red8 33.Bxa4 Nc4! (one of the bishops will go now) 34.Qc3 Qc8+! 35.Kg2 Nxb2. White is left with only a bishop and pawn for the rook and that’s not enough compensation in this position. Although it took another hour or so, I reined in the full point without any real trouble. In round 2, I was white against the young German IM, Tobias Hirneise. He had played in Gibraltar as well, and he was on the board next to me while I was playing IM Irina Krush. Amusingly, both games followed the same variation of the Slav (the Sokolov …Nb6 variation), and I was debating whether to copy his opponent (GM Pia Cramling), who was playing the opening moves for white quite quickly. I decided to deviate though, and although I got a better position, I ended up losing – Cramling, though, ended up winning! This was a new position for both of us, as while I had never looked at it before, he had just left his preparation on the previous move (and had gained 6 minutes on the clock along the way). On his own, he played 17…g4?, which has been played before, and turns out to be a serious error in my view. I didn’t realize it right away, but after a 20-minute think, I realized how to continue. I played 18.fxg4 Nxg4 19.exf5! Nxf2 (forced, as otherwise the Ng4 hangs) 20.Rxf2 Bxf5 21.Nde4. He had seen this position when he played 17…g4, but had assessed the position after 21…Bh6 as fine for him. It’s true that his position looks fine at the moment, but after 22.Qd3, what is Black to do? His bishops look nice on f5 and h6, but they’re not actually doing much. Meanwhile, the Ng6 is silly, the Bf5 will be hit soon with Rbf1, and the d6-pawn is under fire from the Ne4 and potentially a Nb5. On a side note, this incident reminded me of Magnus Carlsen’s response in a recent TIME Magazine interview. Q: How many moves ahead can you calculate on the chess board? A: Sometimes 15 to 20 moves ahead. But the trick is evaluating the position at the end of those calculations. Back to my game though … After 22…Qd7 23.Rbf1, White threatens to take on c5! If then 23…dxc5, 24.Rxf5 nets White a pawn, while on 23…Bxd3 24.Nxd7, Black has no way to get his material back – 24…Bxe2 25.Rxe2 and 24…Be3 25.Bxd3 don’t help his cause. Meanwhile, if the bishop moves, then a knight fork on f6 will be devastating, so he found nothing better to do than to give up his bishop with 23…Bxe4. I played 29.Qg4+ Kh8 30.a4!? – this is another luxury, but I figured I could afford it as he can’t keep me out forever. Meanwhile, the pawn on a4 means that …Bc1 can be met with b3, and Black doesn’t even get the small consolation of a queenside pawn. Instead, 30.Qc8 was obvious and strong (planning 31.Qb8 and 32.Nxd6), but I didn’t want to give him anything on the queenside in return. He tried to keep me out with 30…Nd7, but his efforts were in vain. 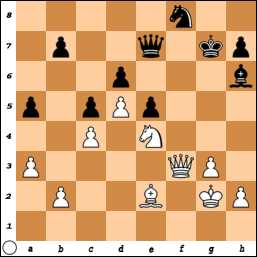 After 31.Qf5 (threatening 32.Bd3 and 33.Nxd6 – it’s mate on h7!) 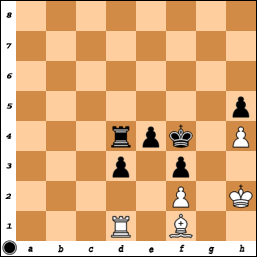 Kg7 32.Qe6!, Black is completely lost. He resigned a couple moves later when it was clear that he’d either have to shed a piece or the d6, b7, and c5 pawns. As I wrote in my last blog entry, I managed to get 4.5 points from my first 6 games in Gibraltar. I generally didn’t manage to put together a complete game until the 6th round, but after that effort, I was feeling like I could make a push in the final four rounds. In round 7, I got the black pieces against GM Sergei Movsesian (2708 FIDE). Movsesian had been close to breaking into the elite of the chess world for a number of years before finally doing so last year, shooting up to 2751 FIDE. He’s dropped since then, but he’s maintained his rating above 2700. When I was preparing for him, I noticed that he almost always avoids the main lines, but while he doesn’t necessarily challenge you from the get-go, he knows his systems backwards and forwards and is very difficult to beat in them. He’s also much more dangerous with the white pieces than with black (as seen in the tournament, where he won all 5 games with white quite easily, and drew all 5 games as black without getting close to a better position at any point). This was the position after 3.d2-d3, and I decided to play 3…Bf5. He answered with 4.c4, and Black’s position is already much worse! I guess I was on autopilot as I hadn’t realized that by delaying Ng1-f3, the Bg2’s diagonal was open. That makes all the difference in the world because Black has no good way of keeping the diagonal closed now. White’s plan is pretty much the same regardless of what Black does: play Qb3 (hitting d5 and b7), exchange on d5 and play Nc3 (hitting d5 again), and then play e4 to finally break down Black’s center. If Black then takes on e4 and retreats his bishop, White plays e5, opening the long diagonal and winning b7; if Black retreats without taking on e4, then White wins a pawn on d5. I sat there thinking and kicking myself for falling into such a simple trap. I ended up playing 4…c6 5.Qb3 Qc8 6.cxd5 cxd5 7.Nc3 e6 8.e4 Bg6 9.exd5 Nbd7! ?, hoping that he’d go pawn-grabbing by taking on e6 and f7. Actually, if he does grab those pawns, Black has good counterplay after 10.dxe6 Nc5 11.exf7+ Ke7! 12.Qd1 Nxd3+ 13.Kf1 Qc4. Black will only be a pawn down after taking back on f7, and White’s development is more screwed up than Black’s. However, he was alert to that danger and continued with 10.Be3 instead. Now I played 10…e5 11.Rc1 Ng4!?. 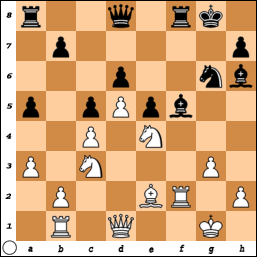 A) 13.Rxc8+ Rxc8 14.fxe3 Nc5 15.Qd1 Nxd3+ 16.Kd2 (16.Ke2 Nxb2 is also no fun) Nxb2 17.Qb3 Bb4+! 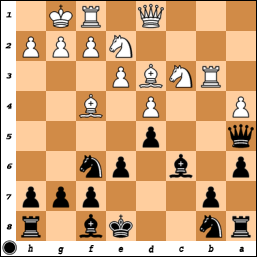 18.Qxb4 Rc2+ 19.Ke1 (the king has nowhere else to go) Nd3+, forking king and queen, leaving Black ahead in material! 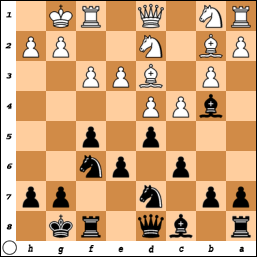 B) 13.Nc7+ Kd8 14.fxe3 Nc5 cuts the protection off for the knight and leaves Black on top. After a 35-minute think, he found a very accurate way of proceeding after 11…Ng4 with 12.Bh3! (hitting the Ng4 and indirectly pinning the Nd7) Nxe3 13.fxe3 Qc7 (threatening to play …Nc5 again) 14.Qa4!, when his advantage is not in doubt. He’s up a pawn and Black has no real compensation. I resigned 8 moves later when my position had deteriorated even further. It’s hard to take anything positive away from a game like this, but on the plus side, I’m not the only GM to have fallen for that same trick. GM Sebastien Maze, who was sitting next to us during this game, fell into the exact same trap against GM Hikaru Nakamura last year at the French Team Championships! I noticed Maze looking at our game intently and giving me a funny look when I played …Bf5, but I didn’t realize he had been on the receiving end of the same beat-down a year earlier. Don’t worry, there’s more fun after the jump! How Can You Falter, When You’re the Rock of Gibraltar? I’ve got a backlog of posts to add now that the tournament in Gibraltar is over, so this will be the first of a few before I start my next event in Cappelle la Grande (France) on February 13th. The Gibtelecom Masters finished yesterday, and I ended up with 6.5/10. Not a bad score point-wise, but I didn’t play up to my expectations or my rating – I lost all the points I had gained in Sevilla to start off this trip. I’ll cover the first 6 rounds in this blog before wrapping up the tournament in a later post. Although 2 Americans tied for first (GM Gata Kamsky and GM-elect Alex Lenderman), neither was involved in the playoff (the top 4 on tiebreaks had a rapid playoff for the title). Emerging from that fight was GM Michael “Mickey” Adams of England. Mickey was once a perennial top-10 player – and one of the “Linares guys” according to Kasparov – but he’s slipped a bit over the past few years and I think this was his biggest tournament win in a few years. In the first round, I won as black against Rafael Montero Melendez, a 2248 FIDE rated player from Spain. As though it’s an unwritten rule for my first-round pairings, he played the Exchange Slav against me. I’ve played the Slav for about 3 years now, and I face the Exchange Variation in about 1/3 of my games with it. After the game, I checked the database to see what the average incidence of an Exchange Slav is amongst games that fall under the ECO codes D10 to D19 (the range for all the variations of the Slav). As it turns out, in my database, it’s about 1 out of every 7 games, so either I happen to be playing a lot of opponents who normally play the Exchange, or they’re afraid of me and try the Exchange in the hopes of a draw. I had gone an early pawn-hunting expedition with my queen, playing …Qd8-b6xb2-a3-a5 (he had prepared the pawn sac idea, as he blitzed through that phase of the game), and now I returned home with 13…Qd8!?. I came up with this move after thinking for about 18 minutes. The idea is to play …Bd6 to exchange off White’s dark-squared bishop, as that would both clear the way for kingside but also relieve some of the queenside pressure I faced. Now, in my head, I continued 18…Qxb7 19.Bxb7 Ra7 20.Rb1, and I didn’t see a good way to extricate the rook, noticing that the rook is trapped after 20…Ne8 21.Bb8. 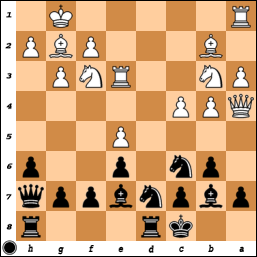 Unfortunately, there are two mistakes in this long line from the Black side – for one, after 21.Bb8, while it’s true that Black’s Ra7 has no safe square, Black has the simple 21…Nxb8 to save it! 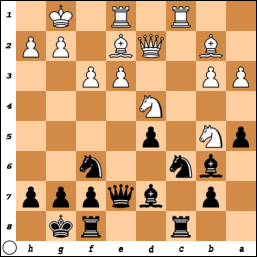 Also instead of 18…Qxb7, Black can play 18…Bd6 with a clear plus. White has other ways of continuing after 13…Be7, but since this line doesn’t work, my idea with 13…Qd8 was probably not the best one. After 13…Qd8, the game continued 14.Qb1 Bd6 15.Bxd6 Qxd6 16.e4 dxe4 17.Nxe4 Qd5 18.Nxf6+ gxf6. White is still down a pawn, but Black’s kingside has been opened up, so his king probably won’t find shelter there. The center has also been opened up a bit, so Black has to be careful about keeping his king on e8 as well! Finally, Black’s still not properly developed, as after 18 moves, all I had to show for my efforts was that I had moved my queen and bishop off their original squares. White had definite compensation at this point, but I managed to outplay him in the ensuing complications, and he threw in the towel 10 moves later when he had shed a couple more pawns to no avail. I drew the following day against IM Kenny Solomon (South Africa). This was pretty disappointing, since I had achieved a completely winning endgame only to throw it away with two hurried moves. 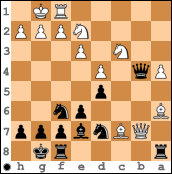 The following day, I drew as black against FM Guillaume Camus de Solliers (France), in a game where my opponent played a rather safe line of the Meran, and I didn’t get any real winning chances. Then, in the 4th round, I had the white pieces against Yves Duhayon (2241, Belgium). I haven’t played 1.e4 in a long time, but for this game, I decided to go after his Ruy Lopez and I achieved a clear plus. Unfortunately, in the following position, after I had played 21.Qd2-c2, I walked into a very nice drawing combination. I could have immediately sacrificed the exchange on e4 with 21.Rxe4 dxe4, and then played 22.Qc3 to cement my control over the dark squares. White threatens 23.Nc5 and various knight forks all over the place while Black’s rooks don’t have any good open files. As Kasparov would say, the quality of his pieces more than compensates for the material disadvantage. Instead, I decided to play 21.Qc2, thinking that I would have time to take on e4 later if need be, and I might prefer to keep the material and kick the knight with f2-f3 instead at some point. Kudos to him for spotting a tactical resource that I just wasn’t looking for. He played 21…Bxe5 22.Bxe5 Rxe5! 23.dxe5 Bd3! !, which forces a draw. The problem is that if I take the bishop with 24.Qxd3, he has 24…Qxf2+ and there is no safe square for my king. If I play 25.Kh1, he has 25…Qxe1+! 26.Rxe1 Nf2+, picking up the queen; 25.Kh2 allows 25…Qf4+, and now if 26.Kg1, Qf2+ repeats while 26.Kh1? Nf2+ is even worse. Finally, 25.Kh2 Qf4+ 26.g3 escapes the knight forks, but costs White his queen after 26…Qf2+ 27.Kh1 Nxg3+. I refused the bishop and so avoided any knight forks with 24.Qxc6, but after 24…Qxf2+, there was still no good way for me to avoid a draw in the end. 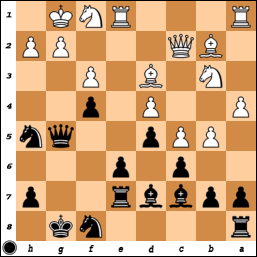 Black’s attack is quite strong, so I had to force a repetition on move 37 with checks on g6 and h6.